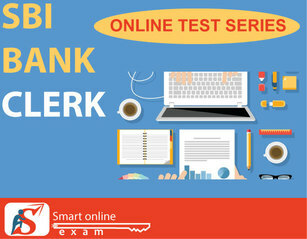 SBI Clerk Mock Test Series help candidates to prepare judiciously for the upcoming SBI Clerk Exams. SBI Clerk Test Series is a sure shot way to succeed SBI Clerk Prelims & Mains. Get a free online mock test, analyse your current performance, and improve weak areas Kick start your preparation now. Online Tests based on Latest Pattern & Syllabus are available in Hindi & English. Coding & Decoding, Blood Relation, Alphabet Series, Syllogism, Seating Arrangement, Tabulation, Alphanumeric Series, Data Sufficiency, Inequality. Simplification, Number System, Number Series, Percentage, Profit Loss, Average, Ratio & Proportion, Time & Work, Time & Distance, Simple & Compound Interest. Reading Comprehension, Common Errors, Error Spotting, Fill in the Blanks, Cloze Test, Sentence Rearrangement. Banking Awareness, Current Affairs from all areas such as: National, International, Sports, Business, Awards etc. Basic knowledge of Computer, What are computer, how it works and its history. MS Word, Excel and Power Point chapters. Really Best quality of test Series. I use its ASM Psycho test series also.